Starring: D.J. Naylor, Brett Claywell, Brandon Hardin, Tyhm Kennedy, Big Boi of Outkast, Big Gipp, Lil Jon and the Eastside Boyz, Killer Mike, and Slim Calhoun. I am a fan of the crime/action/thriller type of films, I have been since I discovered them in my younger years. I would love to sit down and watch the array of Van Damme films or hidden gems I’d find hidden away on the shelves. I never shy away from them, and as I sat down to watch 20 Funerals I was interested to see exactly what this was. The film was first seen back in 2005 and 6 years later it is finally seeing a release here. Not usually a good sign, so how did the film hold up? I guess you could say there is a reason it sat on the shelf for so long, but also it kind of wasn’t a fair decision. 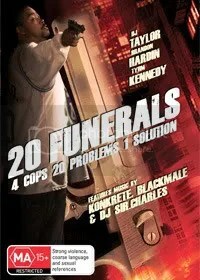 20 Funerals is not a terrible film, it isn’t a very good one either. But there was definitely a sense of effort in trying to make something decent for the small budget, so I have to give them props for that. The story here is a simple and almost by now cliched one; after the murder of an officer four cops decide that simply arresting the criminals is not good enough, so they begin to take them out one by one. Sounds simple enough, and it really should have been. However the film is difficult to follow, and hard to understand exactly what is going on. I am not sure what Anghus Houvouras was going for, but a film like this should have been a lot more straight forward. It does not have a long running time, in fact it barely reaches the hour 20 minute mark. Whether it was intended to be this short or if scenes were cut, it felt like they tried to pack far too much in, rather than keep it simple. I’ll give the film this, it was really well shot for the most part. It did look small budget, but they did a good job of not making it too obvious and done in a way it didn’t hurt the film. The sets and locations were fine, the funeral scene was the best by far, it’s clear that they spent almost what a funeral costs for that scene, the stuff at the police station probably looked the weakest because the budget constraints were obvious. The acting was a mixed bag here, the performances were all over the place. There were points in the film an actor was doing fine, but then over acting would kick in and completely lose it. Or a scene would come up and the actor was just not capable of delivering a solid line, it seemed they were lost. I can attribute that to their skills, the script and the direction. The script was very weak in points, and showing promising in others. Some of the dialogue was very poor and it is no wonder the actors didn’t do better. Some parts worked alright, others not at all. Possibly the weakest are the beginning and end scenes. There was definitely some promise in the film, some of the action was quite decent and it had good ideas. It felt like an experimental student film for the most part, rather than something to be taken seriously. These types of films seemed to be great in the 80’s and early 90’s, but they aren’t made with quite the same affection anymore. It is a shame because this could have been one of those awesome hidden gems you find on the shelf and enjoy on a Sunday afternoon. The copy I reviewed is a screener, so there are no extra features aside from the films trailer. The picture quality on this was top notch, very crisp and clear. The DVD release should look and sound great in that aspect. Thanks to Bill at Gryphon Entertainment for the copy.